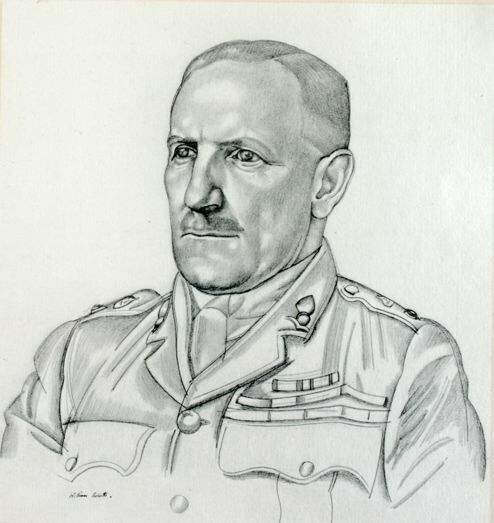 Stewart Francis Newcombe (18781956) served in the Boer War and in the First World War in France, at Gallipolli and in the Heyaz, where he was sent as head of the military mission involving T. E. Lawrence. In Seven Pillars of Wisdom Lawrence wrote that 'Newcombe had constant difficulties owing to excess of zeal, and his habit of doing four times more than any other Englishman would do: ten times what the Arabs thought needful or wise . . . "Newcombe is like fire," they used to complain; "he burns friend and enemy"; and they admired his amazing energy with nervous shrinking lest they should be his next friendly victims' (ch. 41). Lawrence told Roberts, 'I liked your drawing of Newcombe . . . the force and naturalism of this head took me by surprise . . . you have improved on him by putting into him a great deal of your spare solidity' (27 Aug. 1922). And to Robin Buxton he described the picture as a 'wonderful study . . . fierce almost to the point of terror' (28 Aug. 1922).